Kelorenttu is situated in the North of Finland in Lapland, close to Santa Claus's home. Saariselkä village is 200 km north of the Polar circle, 1000 km north of Helsinki. Best way to reach it is by airplane. Ivalo Airport is only 25 km away. You can also come by car or bus. Saariselkä centre is only 600 meters from the Kelorenttu. 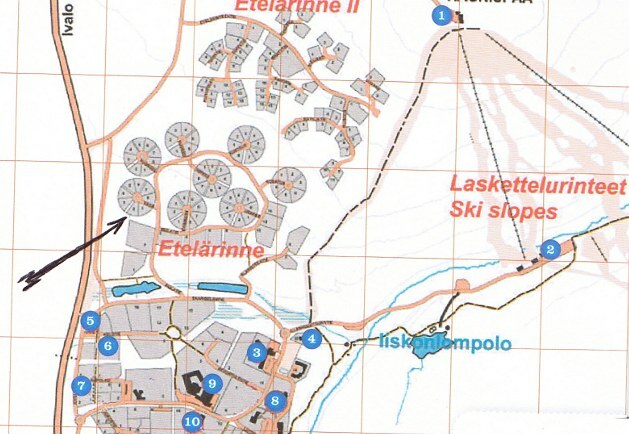 Saariselkä map (arrow points to Kelorenttu).